The traditional vending machine where you go for a bottle of Coke is no more, at least not at Drexel University in Philadelphia. In place of soda and water, they've created a MacBook vending machine (or the MacVending as we call it) that allow students to rent out a 15-inch MacBook Pro if a student were to forget theirs at home. Simply scan your student ID and you can take one of the 12 MacBooks for your own for five hours before paying $5 for each additional hour. Of course, there are security measures employed to make sure nobody runs off with one of their $1500 odd dollar laptops. This provides an excellent resource for students, especially when something urgent comes up and you're short a computer. 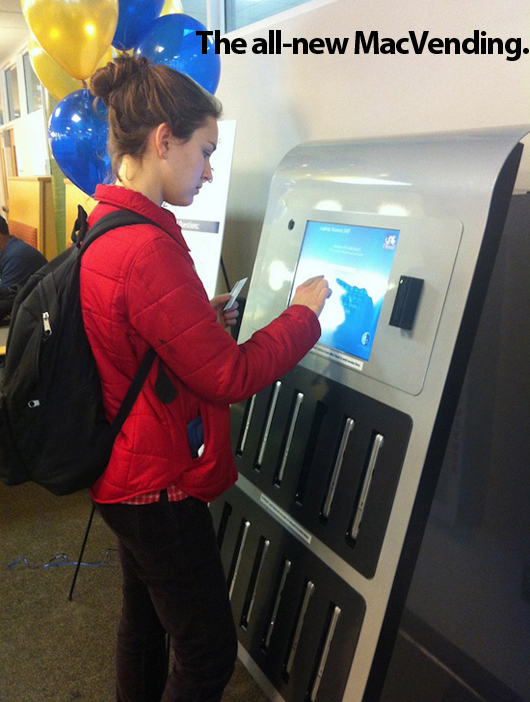 Drexel plans to bring iPad vending machines as well if this new program is well received.